What specific elements top your wish-list for your next home? One of the most common elements homeowners want is a nice view. Beyond that, many people want a quiet neighborhood that is also semi-close to the conveniences of a bigger city. With these two elements in mind, you may be thinking that Scottsdale real estate is the way to go. However, there are not many homes for sale in Scottsdale that can offer breathtaking views as well as peace and quiet. Those that are available are typically over-priced and located in over-crowded neighborhoods. Still have your mind set on Scottsdale luxury homes? Take a look at this comparison between a luxury gated community in Scottsdale and one in Tucson, Arizona. 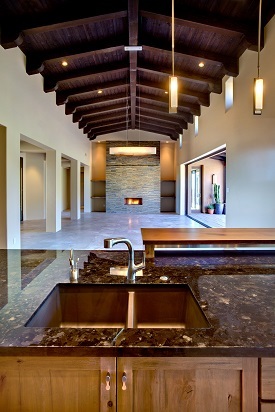 Paradise Reserve is a Scottsdale luxury real estate community located in the Phoenix Mountain Preserve. It includes 14 estate homesites as well as 32 smaller homesites located in “The Village” with luxury homes to be built by Cullum Homes. While this all sounds nice, you can actually find better properties with larger homesites and more amenities if you look outside of Scottsdale. The Residences at The Ritz-Carlton, Dove Mountain in Marana, Arizona offers all of the same main elements as Paradise Reserve but with better perks. As you can see, homeowners at The Residences gain membership to an exclusive golf club upon becoming a homeowner. Comparatively, folks who choose to purchase at Paradise Reserve do not get any exclusive club memberships upon purchase. Instead they must go out and join a golf club on their own accord. You have many options when it comes to purchasing your next dream home, so think outside the box and look outside of Scottsdale to find what you’re looking for in a luxury home.